Two suites of complexly orchestrated jazz that update The Birth of the Cool -- and two takes on the whole shebang. Joe Lovano is a great and madly diverse saxophonist -- a mainstream player who nevertheless has a serpentine taste for harmonic adventure, and a cat who has most certainly found his own sound. Capable of being as big and brawny as any "Texas Tenor", Lovano more often opts for a bristling but fuzzy tone -- something gentle and indirect and quicksilver. Lovano has used his talent and unique jazz sensibility under the major label umbrella of Blue Note Records for some time now, where he has recorded a series of thematic records that seem designed to showcase him in perversely different ways: Viva Caruso, playing mostly Italian songs associated with the opera singer with a "street band" and an "opera ensemble"; 52nd Street Themes, playing '40s bop with his nonet; two Trio Fascination discs featuring various piano/guitarless groups, quartets with featured pianists (two with Hank Jones, one with Michel Petrucciani); a Sinatra tribute; a guitar record; a duo face-off with Cuban pianist Gonzalo Rubalcaba; and even Rush Hour, a wildly diverse collaboration with "third stream" arranger and composer Gunther Schuller that pitted Lovano against a bevy of parallel voices -- strings, woodwinds, you name it. 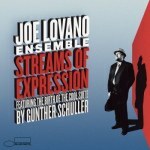 Streams of Expression renews Mr. Lovano's work with Gunther Schuller, but it does so much else as well. On the One Hand... this is exhausting. Granted, Joe Lovano is a restless and huge talent who can take in a diversity of styles and settings. But his Blue Note catalog seems like a mad travel itinerary forcing listeners to hop from one great place to another without ever setting down roots. This tendency is exacerbated by Lovano's impressive multi-instrumentalism -- he plays tenor, alto, soprano, C-melody sax, various clarinets, even percussion. On this latest record, he is scattered within the scope of a single disc -- playing his own arrangements for an eleven-piece band; playing Schuller's reinterpretation of tunes from Miles Davis's seminal Birth of the Cool album; then playing trio tracks that feature not only his conventional saxophones but also a new double-bodied soprano horn called the "aulochrome". I'm pooped just thinking about listening to it. On the Other Hand... this recording is the kind of summarizing masterpiece that Lovano's career has been leading up to all along. Drinking generously from his small group work while also setting his tenor amidst brilliantly colorful arrangements of both originals and standards, Streams of Expression has two approaches that complement each other -- with the musical vocabulary sweeping from the straight bluesy swing of "Cool" to the gnarlier ensemble growls of "The Fire Prophets". OK, Fine, But Then... why do I find it so hard to listen to this record? It seems designed to break my concentration and even vex me. The "Streams of Expression Suite" is referred to in the liner notes as having either five or seven parts, with the parts being interrupted (or even played out of order?). The original material is dedicated to a litany of Lovano's inspirations, but it bookends the Birth of the Cool material, which is a more direct exercise in recreation and nostalgia. Fine as each piece is, the jumble is a cacophonous overload of quality. The "masterpiece" jazz albums -- if that's the word you're going to through around -- tend to have a single brilliant conception: Kind of Blue, A Love Supreme, The Black Saint and the Sinner Lady. Great Music, Friend, Is Not Supposed... to be easy. And this album is layered and rich like the great ones always are. The Lovano suite shifts over several decades of styles in progressive jazz, but it's more an integration than a grab-bag of pastiche. Opening with a free-ballad statement from the trio, it only gradually incorporates the voices of the other horns in stately contrary motion. By its midpoint, however, the first track has the whole ensemble playing in a dense, partly improvised section -- leading to a cascade of whispers from the leader over straight swing. This mesmerizing opening leads naturally to the section "Cool" that could only be followed by Schuller's rich re-imagining of three tracks from the Davis masterpiece. Following it all requires some concentration -- which is as it should be with great music. So, You Really Love The Birth of the Cool Material? Because I find it vaguely unnecessary and padded out. Schuller's arrangements are not mere Gil Evans copies, sure, but there is a nostalgic cast to the project still -- with Schuller's original links between the pieces not changing your overall impression of sameness. Lovano does a superb job of playing his way through the harmonic richness of "Moon Dreams", and it's always great to hear "Boplicity" again -- but these well-known tunes stand in the way of the freshness of the other material. I Do Love It, Man -- Sorry. What Gunther has done with the Cool material is what we need more of in jazz: innovation that includes the tradition. These arrangements, while plainly informed by Gil Evans's originals, are more harmonically complex and layered, and the interlude material helps to concentrate your ear on the way in which Cool was a single conception that led to some of the less "pretty" but equally audacious advanced of the 1960s and '70s. Plus, when Lovano returns with more of his "Streams of Expression" material, we can hear these connections alive and well. "Second Nature" overtly references Ornette Coleman and Dewey Redman, but the arrangement has a block voicing that reminds us of West Coast cool too. "Buckeyes" stabs in tight unison that includes voicing for flute, muted trumpet, and baritone saxophone then moves into a hypnotic counterpoint -- clean and concise even as it seems as modern as tomorrow. Fine, But Are You Giving 'Thumbs-Up' To... the "aulochrome"? "Big Ben" is a handsome melody for a trio performance, but this strange double soprano sax sounds less like an innovation in woodwind design than like a weird electronic effect. The aulochrome has two horn bodies and a fused, double-mouthpiece, with fingerings that allow the horn to be played in a shadowy out-of-tune unison or in a very limited kind of counterpoint. It's kinda cool, I guess, but a gimmick nevertheless. I'd bet you my (uh -- our) house that the aulochrome is a quickly forgotten gimmick before the next Paul Motian Trio album comes out. That, my friend, is the band where Joe Lovano really shows his top-this stuff. Then We'll Have to Agree to Disagree... because that crazy double-horn may never replace the alto, but what's not to love? "Big Ben" has a tipsy, fun quality that is the perfect way to end this otherwise momentous disc -- Lovano seems to stumble home under the street lights while Dennis Irwin's bass and Lewis Nash's drums pave a road of elastic swing beneath him. Maybe you're right that this playing is a far cry from the single-conception purity of Lovano's work with Paul Motian, but the scope of Streams of Expression -- its wider reach and its willingness to cast modern jazz in a more arranged format -- makes it a greater risk too. And -- even with the aulochrome track -- the risk is well worth it. If I'm really going to make up my mind, perhaps I should listen to this disc again. Which isn't such a bad fate... or so I seem to think.